Get both a 303 Fabric/Vinyl Cleaner and 303 Fabric Guard in this convenient combo kit. Powerful enough to protect fabrics in the harshest environment …outdoors. On outdoor fabrics, 303 High Tech Fabric Guard restores lost water repellency and stain repellency to factory new levels. 303 Fabric Guard resists soiling, impedes mildew formation and helps protect against the sun’s harmful UV rays. Proper maintenance with 303 Products will add to the life of your fabrics, save you money, and … It’s Easy! 32 oz. Trigger Sprayer / 150 to 200 square feet of coverage. 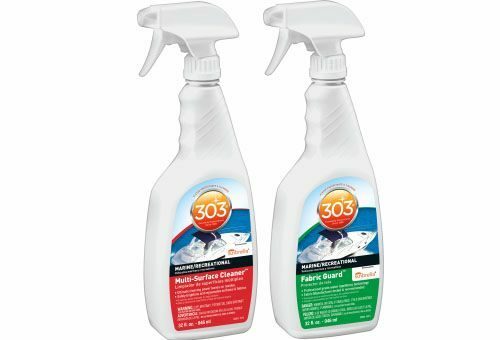 303 Fabric Cleaner contains no soaps, detergents or solvents. Non-toxic, biodegradable and rinses residue free. 32 oz. Trigger Sprayer / For general cleaning, use 4 oz. per 1 gallon of warm water. Recommended by Sunbrella® Order No. 61057.